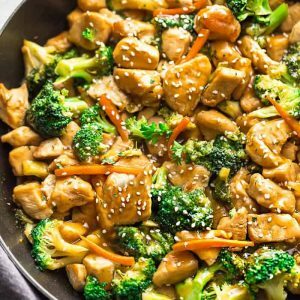 Instant Pot Chicken and Broccoli Stir Fry – a popular Chinese takeout favorite made easily in the pressure cooker in under 30 minutes! Easy to customize and perfect for busy weeknights. Quick and easy stir-fries are one of the of our favorite things to make when we want dinner on the table fast. We grew up eating a different stir-fry almost every night of the week depending on what my mom had in her fridge. I love that with just a few pantry ingredients, you can have your own restaurant quality takeout style meal at home. This Instant Pot Chicken and Broccoli Stir-Fry is the perfect one pan dish for using up any lingering vegetables on a busy weeknight. Our recipe uses broccoli and carrots but you can also use snap peas, broccolini, asparagus or even bok choy if that’s what you have on hand. 2. Cut the chicken into bite-sized chunks and season with some sea salt, black pepper and 1-2 tablespoons of the sauce. 3. Prep and cut up your broccoli, carrots or any other vegetables you like while the chicken marinates. 4. Turn on your Instant Pot and press the SAUTE button. Add oil when hot then brown the chicken for about 1-2 minutes. Add sauce along with the water / chicken broth and cover with the lid. 5. Lock the lid and push the valve to SEALING. Press MANUAL or PRESSURE COOK for 4 minutes. 6. The Instant Pot will take some time to come to pressure. Once the 4 minutes is up, use a long spoon and push the valve to VENTING for a QUICK RELEASE. 7. Once all the pressure is released, carefully unlock the lid. Press the SAUTE button, then whisk together the arrowroot starch (or xanthum gum) then stir into the Instant Pot. 8. Add the vegetables and allow to cook for 3-4 minutes until the broccoli is tender and the sauce has thickened. Adjust seasonings and add more water as needed to thin out. Give everything a final tossing to coat well. 9. Garnish with sesame seeds and / or green onions if desired and serve with your favorite sides. IS THIS INSTANT POT CHICKEN AND BROCCOLI PALEO OR KETO-FRIENDLY? If you’re trying to eat healthier by following a paleo or keto diet, I’ve included notes and substitutions so that you can stay on track of your goals. For low carb, you can leave out the carrots or swap with another lower carb vegetable like bell peppers, zucchini or asparagus. Instead of regular jasmine or brown rice, serve with a side of cauliflower rice or over a bed of zucchini noodles. WHAT CAN I SERVE THIS INSTANT CHICKEN AND BROCCOLI WITH? Besides brown or jasmine rice – quinoa, spiralized zucchini noodles or cauliflower rice are all delicious options. 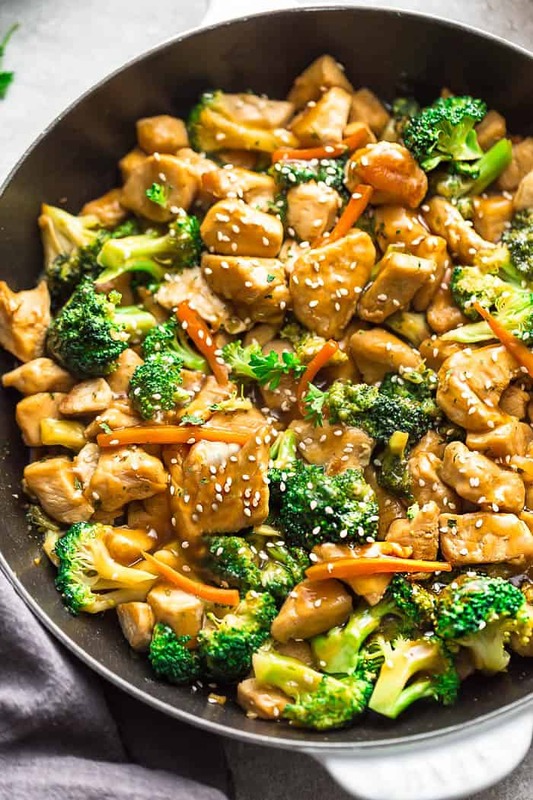 No matter which way you choose, this Instant Pot Chicken and Broccoli Stir Fry is a healthier, tastier and easier way to get your Chinese takeout craving fix! Instant Pot Cashew Chicken Stir Fry - a popular Chinese takeout favorite made easily in the pressure cooker in under 30 minutes! Perfect for busy weeknights. In a medium bowl, combine the soy sauce, oyster sauce, sesame oil, sweetener (if using), Mirin (if using), ginger and garlic for the sauce. Set aside. Season chicken with salt, pepper and 1 tablespoon of the sauce/marinade. Allow to sit while you chop and prep your vegetables. Turn your Instant Pot to SAUTE then add in oil. Once oil is hot, add the chicken and allow to cook for 1-2 minutes. Pour in the remaining sauce along with 1/3 cup water (or chicken broth). Cover with lid. Once all the pressure is released, carefully unlock the lid. Press the SAUTE button, then whisk the arrowroot starch (or xanthum gum) with 2 tablespoons water until combined and stir into the Instant Pot. Add the broccoli and carrots and cook for 4-5 minutes, or until the vegetables are crisp-tender and the sauce has thickened up. Adjust seasonings with salt, pepper or red pepper chili flakes an / or add more water as needed to thin out sauce. Give everything a final tossing to coat well. Transfer to a platter and serve warm on a large platter or over zoodles, cauliflower rice (paleo), quinoa or regular rice or noodles. Sprinkle with sesame seeds and green onions if desired. I did use the coconut OIL & the coconut sugar. As I didn’t have the mirin i used soy SAUCE. I DID not add any of the options listed. I ADDed sweet red peppers & SNOW peas. Served over Basmanti rice, we really enjoyed it! Not one complaint at our table tonight (unusual)! The chicken was tender, the veggies perfect & the sauce delicious! This wAs dElicious!! Thank you! my faMily loved this! I used coconut oIl, coconut aminos, fish sauce, and truvia. Next time i’ll add even moRe veggies. Thanks!! OMG i should have tripled this recipe!!! Delicious. MAde this for supper. Used BROCCOLI and red pepper. Added the green oinion and chopped cashews to serve. Meat was very tender and moist. Veggies very tasty. I used the fish sauce COCONUT sugar, 1/2 Tamari and 1/2 low SODIUM soya sauce. Did not have Mirin so used cookeing sherry. Will DEFINITELY make again.